Powered by Mom Blog shares the Vintage Chic for Modern Mamas Guest Giveaway! One lucky reader will win a Rooster Diaper Bag, you choose the pattern! Welcome to the Vintage-Inspired 2 Red Hens Giveaway! Sponsored by 2 Red Hens and Hosted by Mom Does Reviews and her fabulous blogger friends! Founded in 2011 by designer and “Mama Hen” Lori Holliday, a modern day renaissance woman with an eye for fashion and knack for domesticity. A former mechanical engineer, Holliday draws inspiration for her designs from her upbringing on a farm near Phoenix. As the 13th child in a family of 14 children, Holliday learned the value of craftsmanship, re-purposing and enhancing the beauty of all things old. 2 Red Hens Studio strives to bring function and aesthetic innovation for baby, toddler and mom. Be sure to check out Lori’s other line, www.galloenfuego.com, interesting products made from decommissioned fire hoses. These custom-designed, highly functional bags gives mom all the style and sass she had before baby came along. 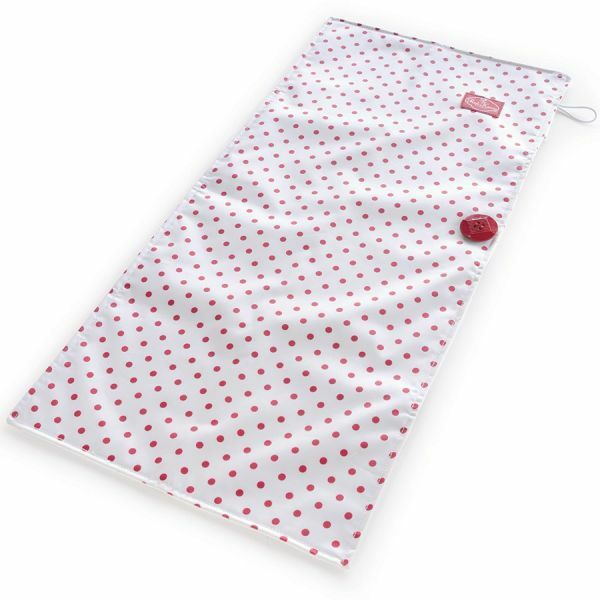 Includes extra long changing pad in 2 Red Hens signature red dot pattern. You don’t have to change your style- embrace it with 2 Red Hens! Be sure to complete the mandatory entries and only claim the ones you have completed! Participating bloggers are not responsible for prize fulfillment. I would choose the Chevron Stripes Rooster Diaper Bag. I would choose the Owl Dots Rooster Diaper Bag. I’d choose the Pink Lemonade pattern. Thanks. I love the peacock pattern. I really REALLY love the Peacock Mum Coop Carry-All Diaper Bag, but the same pattern in the Rooster Diaper Bag is cute too. 🙂 Thanks! I like the owl dots bag. It would really make a statement! I would pick Grey Damask Rooster Diaper Bag. I love the chevron stripe pattern! So hot this spring! I’d choose the chevron pattern. I like the Grey Damask print. Grey Damask Coop Carry-All Diaper Bag is so great! love them all.. but owl dog pattern is my favorite !! I would choose the Peacock Mum Rooster pattern. I like the Peacock Mum Toy Nanny.